The clean tech industry is growing up. The most obvious sign? It can finally qualify for a loan. Experts say that the project finance innovations being developed now for the clean tech sector will likely have a big impact in coming years, drastically lowering the cost of capital for solar projects, energy efficiency retrofits, and other clean technology. The current era of financial innovation didn’t happen overnight. Eckhart says that government incentives like European feed-in tariffs, tax credits, and renewable portfolio standards in the U.S. dating back to the 1970s have now moved the industry into its capstone phase. These financial market innovations in clean tech have direct implications for venture capitalists, pointed out Skip Grow, a managing director at Morgan Stanley, at February’s Cleantech Innovation Summit. The cleantech industry has come up against real challenges in figuring out how to attract basic financing from capital markets, owing to a couple of major challenges: since cleantech projects are usually relatively small, individual financings can be inefficient and expensive; and historical performance data hasn’t been around long enough to comfort investors and help them determine risk profiles. Many actors within the cleantech space have had to get creative about how to attract capital at affordable rates by finding workarounds to these obstacles. “It’s taken time to get the clean tech industry thinking about redesigning and recasting itself so that it qualifies for large-scale capital market financings down the road,” Eckhart says. In other words, the financial innovations that have been percolating within the clean tech industry haven’t necessarily involved cooking up new financial structures or tactics. Rather, the industry has had to figure out how to qualify for very traditional types of capital market financing structures. So, how are they finding money? “What’s been innovative has been taking existing financing structures and applying them to a new asset class,” says Charlotte Kim, an attorney at Wilson Sonsini Goodrich & Rosati, a practice focused on global corporate finance with particular expertise in energy, among other fields. Kim says that one approach clean tech companies have had to take is aggregating smaller projects into larger funds since banks dealing with this sector generally don’t consider transactions below $100 million worthwhile because of the legal and structuring costs they incur. “That means there’s a lot of creativity going on in how to aggregate projects—pool and package smaller projects so that they can add up and be financable,” she says. “I think we’ve started to see that in the residential solar space, and we’re also starting to see it in energy efficiency.” She adds that energy storage is another promising area for that approach, but that “it’s still early days” for that sector. But policy initiatives, like the announcement in October that California will mandate its major utilities to add 1.3 gigawatts of energy storage to their grids by 2020, will drive demand, and therefore financial innovation, she says. New York has signaled that it will follow in California’s footsteps with the announcement in January that it will offer incentives to reduce grid load by 100 megawatts.Smart Grid News reported that the state is offering subsidies of $2,100 per kilowatt for battery storage, and $2,600 for thermal storage. Nikhil Garg, a vice president at Black Coral Capital, a venture capital firm focused on clean tech companies, agrees that the aggregation of smaller projects into larger pools has been a major boon for the industry. Garg believes that general concept—currently most popular in financing distributed solar projects—is likely to extend into other clean tech sectors. Energy efficiency will be the next big draw, he believes, followed by several more, including waste-to-value technologies. Garg adds that developments in big data can help address that other major challenge—a lack of comfort among investors in various clean technologies’ historical performance. He adds that this increased comfort is attracting new investors to the space. 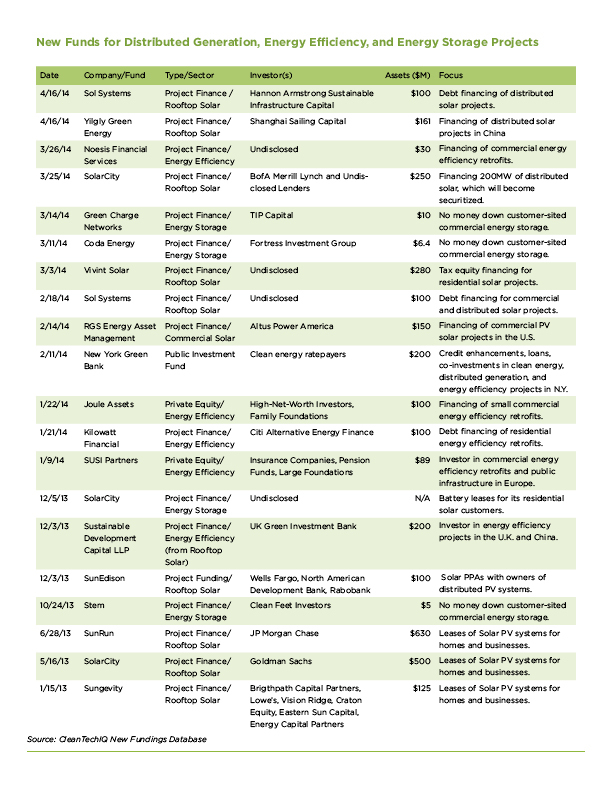 While clean tech project finance was largely dominated by banks and infrastructure-oriented private equity firms as recently as five years ago, the space now has a more diverse set of investors. Garg says he’s seen an influx of family offices entering the space, as well as retail investors who are investing via REITs and yield cos that floated on the public market last year.